If you have ever said to yourself, “I need to eat more fresh fruit & vegetables,” now’s your chance to make good on it. Now, there’s no more excuses! 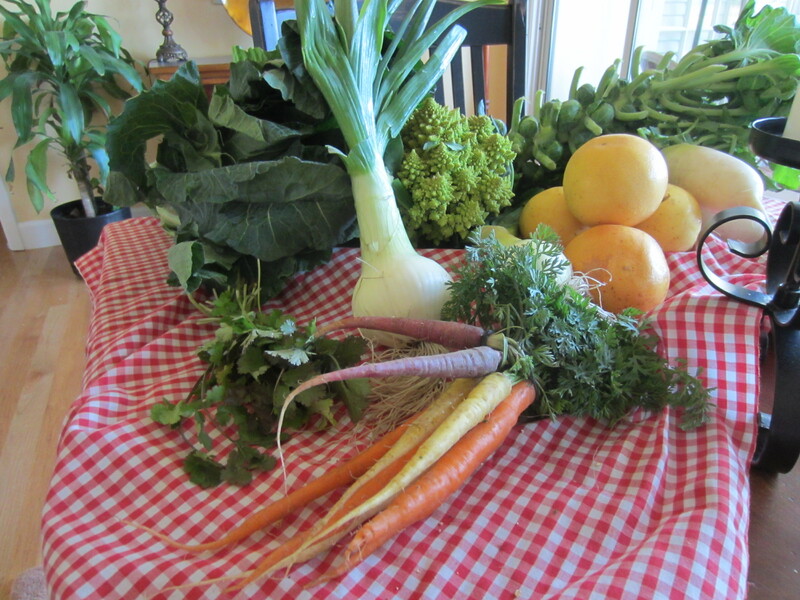 You can have local farm fresh seasonal vegetables, fruit, herbs, eggs, fresh baked bread and cheese delivered to your door once a week by a fabulous company called Local Fare Farm Bag South. The delivery areas are divided by North and South. North is owned by South’s sister company. Jacksonville, St Johns, Ponte Vedra, Nocatee, Orange Park, Fleming Island, Middleburg,Green Cove Springs, Jacksonville Beach, Neptune Beach, and Atlantic Beach, Florida. I live in St. Augustine, so my review is of Local Fare Farm Bag South. I had recently signed up for this service and I was so excited about it I had to find out more. It is owned by two partners, Bryant Loeffler & Laura Gay. They’ve been in business approximately 3 years. I spoke to Bryant at length about the business and decided I wanted to share this information with others who care about their health and the health of their family. He stressed to me the importance of knowing where your food is coming from. 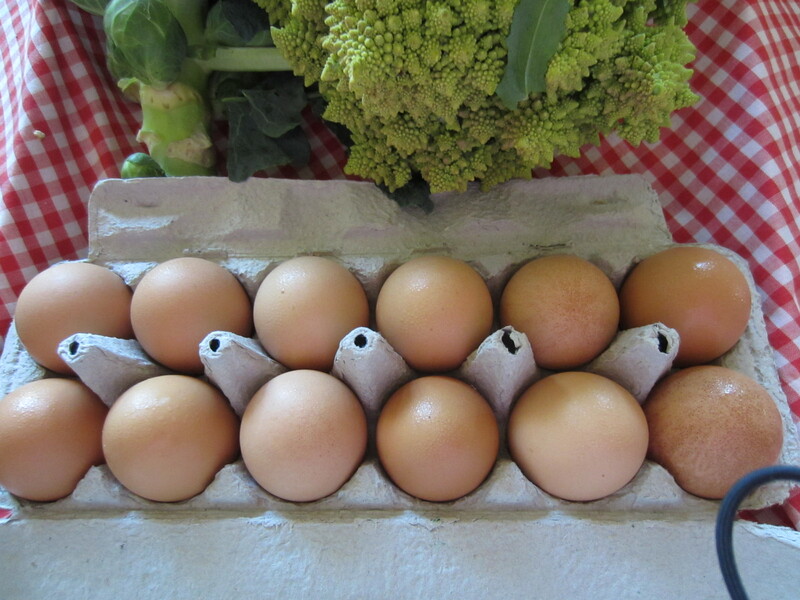 They visit the farms that they source from regularly, so they are confident that your produce and eggs are organic. Fruits and vegetables you are buying from them are delivered within 24 to 48 hours of harvest time. Farm fresh organic eggs are delivered within one week. Not only will your delivery be at the peak of freshness and quality, it will be at the height of its nutritional profile too. Local Fare South works with farmers who use only certified non-GMO seeds and organic methods for farming. 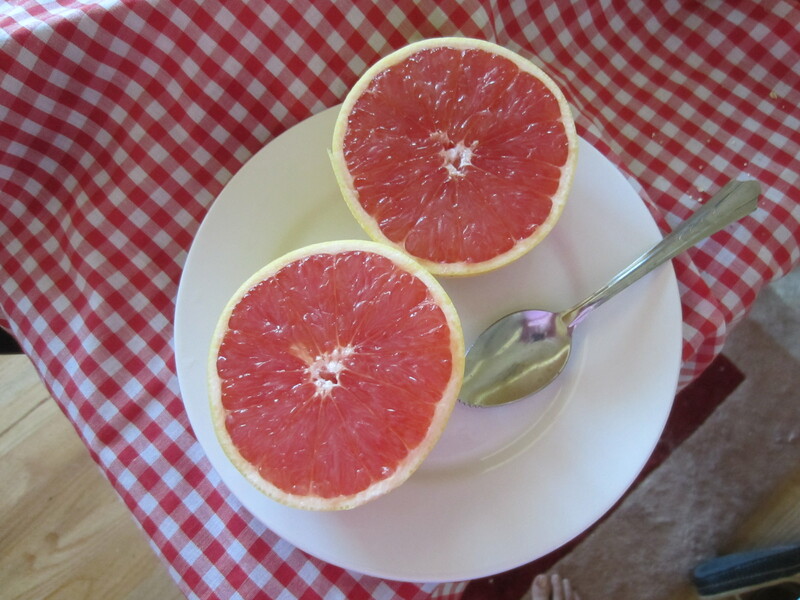 Eating seasonal fruits and vegetables is one of the healthiest things you can do for your body. The nutrients in these vegetables are what your body needs at that particular time of the year. For instance, watermelon and tomatoes are loaded with lycopene. Lycopene helps protect your skin from the sun. every week, so it’s always a big surprise to see what you’re getting. It’s so easy to do. Just visit the website and select your location. It will bring you to a shopping cart, where you can decide what size bag you would like and if you would like it delivered weekly or bi-weekly. From there you can choose add-ons such as organic eggs, artesian cheeses, honey, specialty sea salts, or extra fresh baked bread. I added a dozen organic eggs to my order. 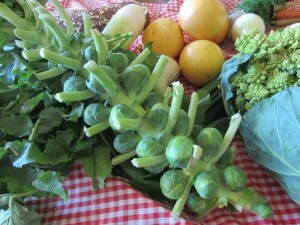 They come from Cow Creek Farms located in Edgewater FL. The hens are fed an all natural feed, organic fresh greens, organic carrots and organic flax seed. This makes the eggs very high in Omega 3’s and vitamins. The hens live in a cage free environment. They may be the best eggs I have ever tasted. Crack one open and you too will be able to see the freshness for yourself. 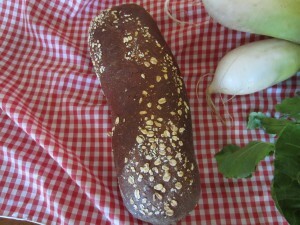 Every week, they include a loaf of fresh baked bread in your Farm bag. It’s baked the morning of delivery. My husband and I couldn’t wait to tear off a corner and give it a try. It’s fabulous! 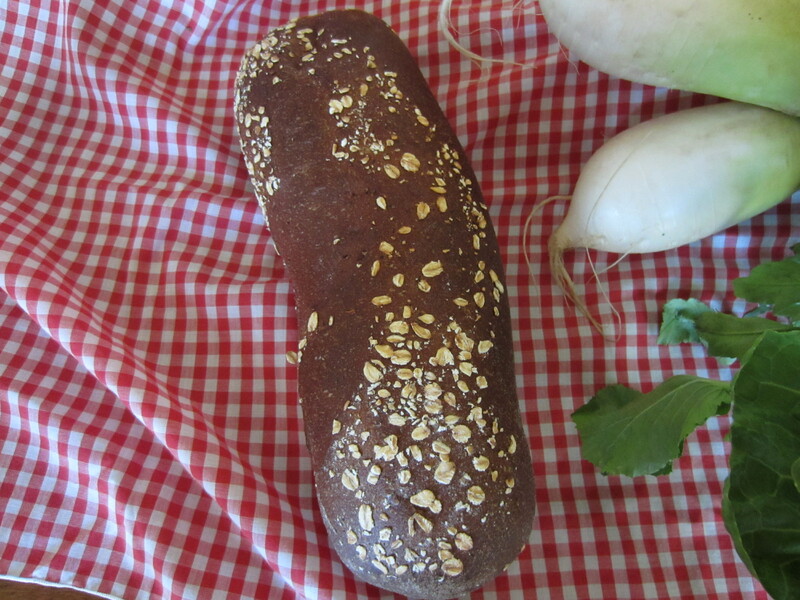 This particular week it was French Pantry’s “SQUAW BREAD.” It’s made with whole wheat flour, brown sugar, molasses, honey, yeast, salt, water, malt, oats, eight grain flour, including seeds and nuts. YUMMY! deliciously sweet and juicy Ruby red grapefruits, Romanesco Cauliflower, daikon radishes and brussels sprouts on the stem. Fresh baked squaw bread came with the bag and I also added the eggs. All of the pictures shown here are from my bag. If you don’t eat carbs or go gluten-free, “no worries.” You can substitute for your favorite fruit or vegetable that will be in that week’s bag. If you ever need to substitute a fruit, vegetable, or your bread you can shoot them an email on Sunday night and they will make sure they customize the bag for you. Each Saturday, you are sent an email notification reminding you of this weeks’ delivery. At this point you can add anything you’d like to your delivery and check the newsletter under the recipe section to see what fruit and vegetables you will be receiving. The newsletter has recipes and cooking tips for this week’s bag. They also have a library of recipes on their website and cooking videos on their Facebook page. This is what the newsletter from my first week looked like. We love this service. The produce is seasonal, fresh and healthy. They offer great service and organic produce at a reasonable price. It’s a fantastic way to try new vegetables and enjoy a healthy lifestyle. It’s a way to support your local farmers and organic, non-GMO farming practices. The best part is, they bring it to you with no delivery fee. So now you have no excuses not to eat your vegetables.